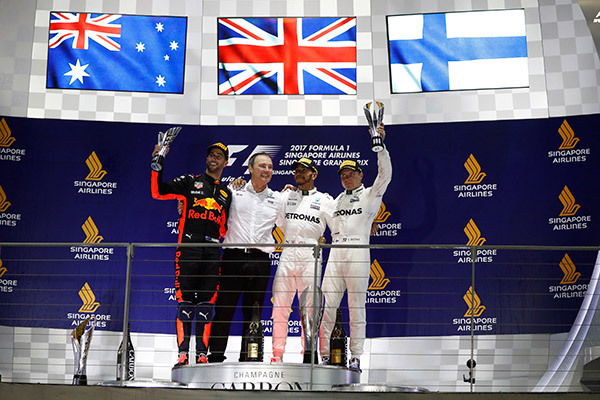 17 September 2017, Singapore – Lewis Hamilton confounded expectations to take his third Marina Bay Street Circuit victory, his seventh of 2017 and the 60th of his Formula 1 career in Sunday’s 2017 Formula 1 Singapore Airlines Singapore Grand Prix. 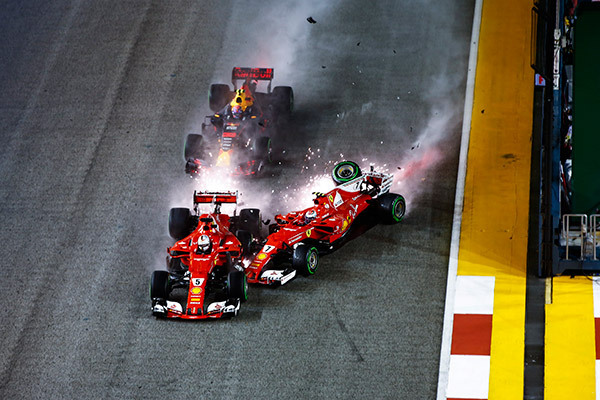 With rain falling on the race start for the first time in Singapore’s 10-year Grand Prix history, the major drama all happened within the first three corners of the opening lap when the Ferraris of pole-sitter Sebastian Vettel and Kimi Räikkönen and the Red Bull of Max Verstappen all crashed out. The young Dutchman was caught in a pincer movement by the two scarlet cars, taking his car and Räikkönen’s out instantly, while Vettel spun seconds later as Hamilton’s Mercedes streaked through from the third row to take a race lead it would never relinquish. Third, rounding off a superb day for Mercedes, was Valtteri Bottas, a result that means Hamilton is now 28 points clear of Vettel in the drivers’ title race while Mercedes lead Ferrari by 102 points in the constructors’ stakes. The early chaos made openings for other drivers and they took full advantage: Carlos Sainz, who will leave Toro Rosso at the end of the year, scored his best-ever finish in fourth ahead of Sergio Perez’s Force India, Jolyon Palmer, dropped by Renault for 2018 to make way for Sainz, achieved his best F1 result in sixth, and Stoffel Vandoorne’s McLaren was eighth to give the Belgian his own highest finish. 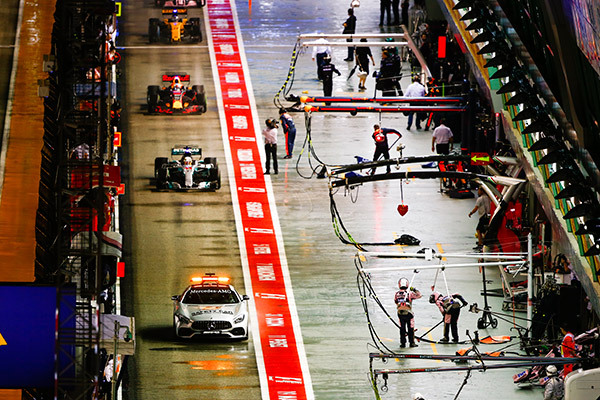 With the race ending at the two-hour limit after 58 of the scheduled 61 laps, only 12 cars finished, the lowest in Singapore’s first decade as a Grand Prix venue. Hamilton sweetened his day even further with a new lap record of 1 minute 45.008 seconds and summed it all up in one sentence. Away from the frenzy of F1 Ringo Chong and Martin Ragginger had great days of their own in the two support categories. Singapore driver Chong completed an outstanding double for the weekend in the Ferrari Challenge Asia Pacific, while Austrian ‘Raggi’ also took his second win in two days in the Porsche Carrera Cup Asia, where local drivers Andrew Tang and Yuey Tan were seventh and 11th respectively. Sunday’s off-track highlights brought Calvin Harris, Duran Duran and Seal to centre stage around the Circuit Park to round off a 10th Singapore Grand Prix weekend attended by an above average crowd of 260,400 fans.